Why have my laundry room under the home schooling blog? Because getting laundry done in the midst of all the other demands of a home schooling mom can be a challenging task. You can’t neglect school to do laundry, and you can’t neglect laundry to do school. You HAVE to do them both. Granted, you are at home most of the time, and nobody will know the egg on your favorite sweatshirt is from last week, not that morning, but there’s something so refreshing about having clean clothes in the drawers….all the drawers….all the time. Having an efficient laundry room is half the battle. The size is irrelevant, as you can see from my pics below. Functionality is #1, looks is #2. OK, so I like antiques and I like to see them when I am working. It might not be a priority to everyone, but something as simple as hanging pics your kids drew or a beautiful painting or photograph above the washer and dryer can certainly make the time spent in the room a little more pleasant. My mom, who raised six kids, was the one who began this system of sorting dirty and clean laundry into appropriate containers. I have added my own touches to her system, making sure that the laundry room has everything I need to keep up on the laundry the most efficiently. Not only do I always know what laundry needs to be done and I enjoy being in this little space because I have made it attractive to my eyes. 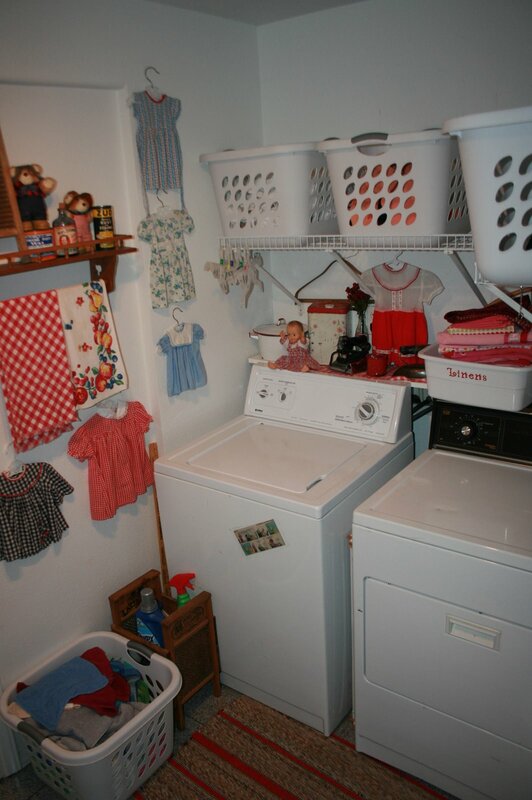 As you can see, my laundry room is so tiny, I had a hard time getting a picture of it. The smallest doll dresses on the wall were made by my mom when she was a young girl. I cherish them. The shelf on the wall contains some stuffed bears and some old laundry supplies. In case you ever wondered – if you knock over an old bottle of bluing that doesn’t have a cork in it, it makes a really, really, big mess. I carved my own cork for the bottle after that incident. Begin with the full hamper. This is in the upstairs hallway by the bedrooms. If the clothes aren’t in here, they don’t get washed. If they are in here inside out, they get washed inside out. 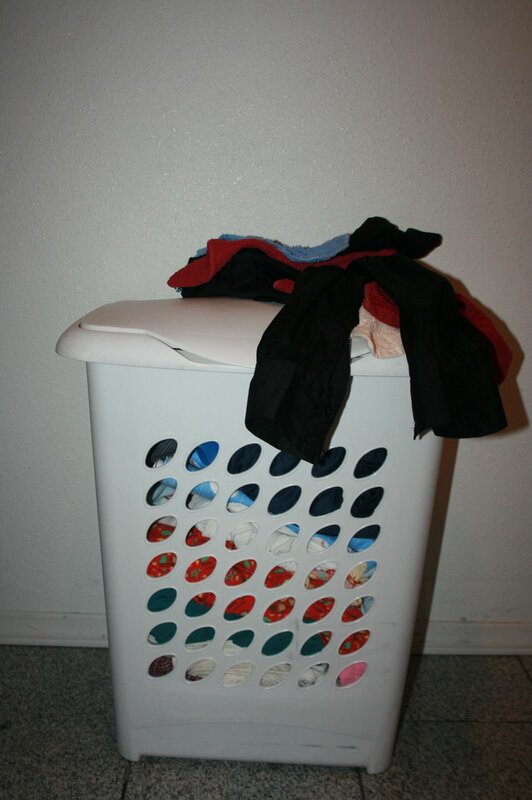 If the undies are still in the pants, (sorry, gross reality – you’ll get used to it) they get washed, dried and put in their laundry basket whatever way they come out of the dryer. Laundry gets sorted into baskets. From left to right I have whites, red, lights and darks. (I haven’t labeled the baskets yet, haven’t hit on the idea that would be sturdy enough to last and would fit the decor…any ideas?) The towels/jeans basket has to go on the floor on the left side. When a basket is heaping full, it makes a load. In my other homes that had larger laundry rooms, the dirty clothes containers were kitchen-sized garbage cans, either under an antique chrome/red table or under a counter. Then, clean laundry tubs could be placed on top of that work surface. My husband mounted a white shelf board flush with the tops of the washer and the dryer, giving me a little extra space for stuff. On the far left, the round enameled tin holds clothespins and lingerie bags. The rectangle shaped tin holds two or three boxes of extra dryer sheets. There is a red tin cup you can barely see in front of the red dress, but it holds all those little treasures you find in pockets – legos, chapsticks, phone numbers scribbled on scraps of paper, business cards, bobby pins – you know those things that would ruin the wash? I KEEP all money I find. On the left side of the white shelf are tubs, the first for linens, the next is for Mom and Dad. You can barely see it, but tucked between the washer and dryer is a folding rack to dry items that cannot go in the dryer. Everything I need to do laundry is in this room. The door mounted ironing board was a huge bonus I added recently. It makes it so much easier to actually get the ironing done. The red gizmo attached below is for plastic bags for the garbage can. You can get a view of the other sorting tub, for towels and jeans, and the box that holds laundry supplies. Close up of the washboard container I found to hold soap, bleach, oxy, Spray ‘n Wash, and an old tooth brush for scrubbing collars and stubborn stains. This is in front of the dryer. 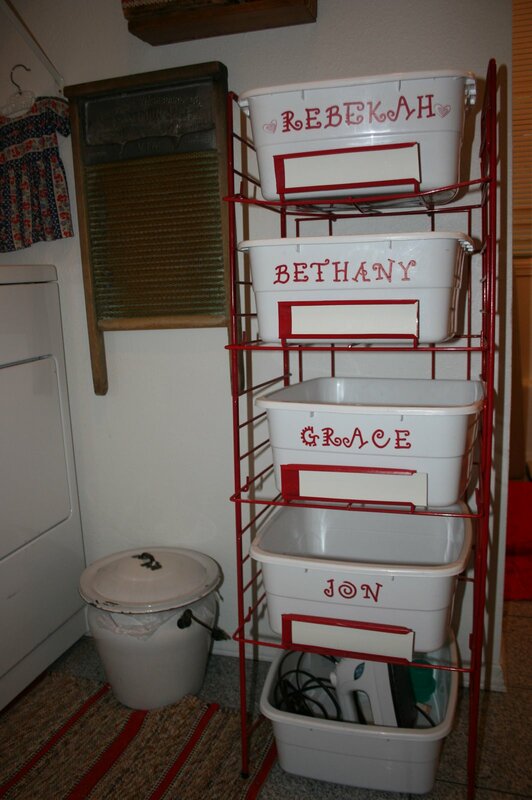 Dish pans labeled for each child. Clothes are folded straight from the dryer into these bins. I don’t leave them in the dryer or leave them in baskets to get wrinkled up again. I save a huge amount of time by being faithful to this routine. The bottom bin holds iron, extension cord, cool plastic cup to fill my iron with water. Notice the garbage can? It is an old diaper pail. Love my old junk. Love the old washboards hanging on the walls, so glad I don’t have to actually use them. And, by mounting the ironing board on the door, you are guaranteed solitude when ironing because the door is SHUT and nobody wants to come in and help. Jon took this pic of me multi-tasking: I am sipping a latte and listening to a podcast on my Zune on Roman History from Berkeley Professor Isabelle Pafford, while ironing, of course. By creating an efficient, pleasant room, you are more productive and less likely to get behind and create the “Mt. Washmore”, referred as such by my friend, Annie, with or without the latte. 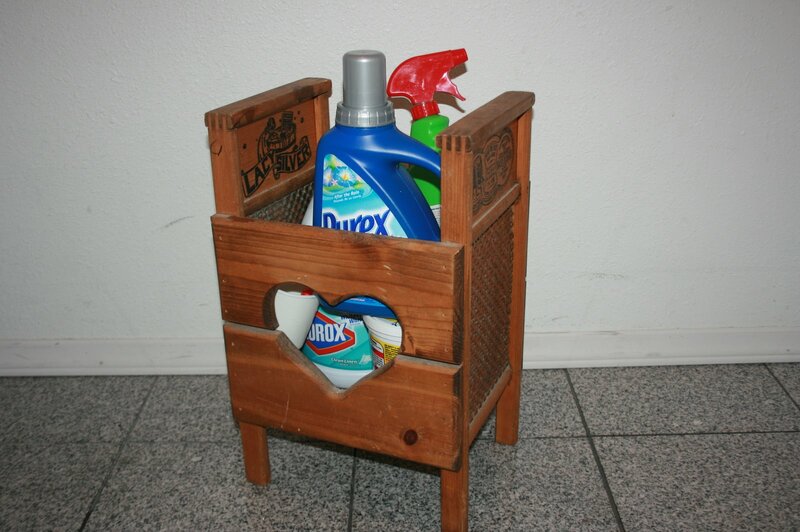 This entry was posted in Isabelle Pafford, organizing a laundry room on February 10, 2009 by Mindy. thanks for sharing your tips. My dream is to have a laundry room! My machines are in the kitchen, so I can't be as organised or as efficient as you. I'm also struggling to get down to the machines to load and unload right now as 34 weeks pregnant! Time to go find my kids some clean underwear for tomorrow…! I can sympathise with your dreams. 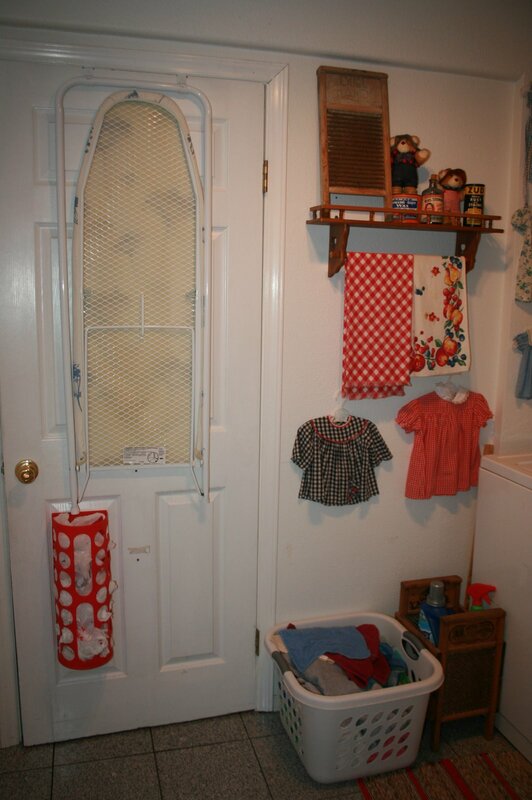 My first "laundry room" was a washer in the bathroom and I had hooks along the celing in my kitchen. On laundry day, I stretched rope with loops on them across the room to dry my laundry. In all these things, we rejoice in our blessings, make do with what we don't have and love our little ones who make it all worthwhile. Congrats on the coming baby! What a nice routine! I have a laundry day currently. i think what is getting me in a pinch is the fact that I am not always faithful to fold right out of the dryer! If I could just do that, you would not see yucky piles of clothes. I think I am going to try what you have suggested! Thank you so much!!!!!! Your post was most helpful. I currently have a certralize laundry area and needed a little encouragement in keeping it all pretty and organized. For now it is just functional and the clothes stay clean most of the time. Currently, the outgrown clothes, and winter accessories (hats, gloves, and scaves) have just found their home on top of the drawers calling out to me each time I walk past them saying, "find home for me and put me away".